When David Robinson and I launched Flipped Startup, we knew that a key theme of the content we create and the workshops we give is to provide lifelong learners with examples and experiences of the power of flipping their point of view. Somehow I forgot to share with David that this was not a new insight, but a topic I’ve collected examples of for years. So we walked down my feeble memory lane (I really need Gordon Bell‘s Total Recall engine) and I shared some of the more important “flipped insights” I’d come across over the years. “Betty Edwards has used the terms L-Mode and R-Mode to designate two ways of knowing and seeing – the verbal, analytic mode and the visual, perceptual mode – no matter where they are located in the individual brain. You are probably aware of these different characteristics. L-mode is a step-by-step style of thinking, using words, numbers and other symbols. L-mode strings things out in sequences, like words in a sentence. R-mode on the other hand, uses visual information and processes, not step-by-step, but all at once, like recognizing the face of a friend. “Most activities require both modes, each contributing its special functions, but a few activities require mainly one mode, without interference from the other. Drawing is one of these activities. 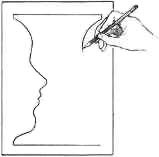 For learning to draw portraits, she instructs the student to draw the subject upside down and backwards. My wife, who claims no artistic talents, drew the most amazing portraits of our three young children. She would go into their bedroom while they were asleep and draw upside down and backwards in the dim light. We were all excited to see how quickly (in a matter of days) her portraits improved with this simple technique. You can gain some insights into this technique by trying the Vase/Face exercise on her website. Through the synthesis of the above contributors to flipped perspectives, I started practicing the flipped perspective in both the creation of software products and with the teaching of the flipped perspective to design and MBA graduate students. The process begins with the key source of information – the customer. The digital business sells first, then produces. Companies like Dell and General Electric are particularly good at this model of digital business design. In the information systems business the result of this sequence is that most products are not successful until the third version when the fit of technology to activity is finally realized. These vignettes are then gathered into a powerful story or scenario of use that guides the product developers to a powerful system of innovations. Perhaps, the most accessible example of this process in action is the constant stream of innovations released through the Amazon.com Books web site. From the detailed observations of users trying to buy books in a physical bookstore to the stream of innovations related to trusted recommendations from a myriad of user participation, the site continually reinvents itself by first paying attention to user activities. The combination of Flipped Product Design with a powerful Digital Business Design leads Amazon.com in providing value to its loyal customers. At every step of this new product design process, innovations are grounded in the observed activities of real users so that there is little guesswork needed as to what to create for whom. Move from burdening talent with low-value work to gaining high talent leverage. Abstracting from all the best research they could find on behavior, the authors described what they called Model 1 behavior. People or organizations are driven by Values, Beliefs and Theories which lead to actions in the context of those Values. The actions then have consequences which feed back into further actions. Most people and organizations stop there and operate on this simple feedback loop. This kind of model is useful for routine interactions but is very poor at learning or adapting to new opportunities which arise. 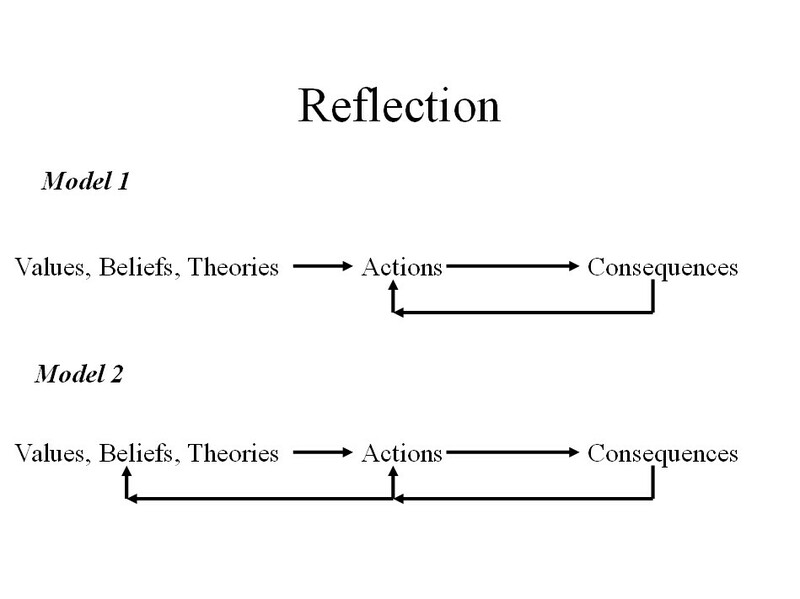 Model 2 behavior is characterized by adding another feedback loop of the consequences cycling to the Values, Beliefs and Theories level. People and organizations that utilize this model are quite adaptive to their environments. Now that we have unprecedented levels of technology and connectedness in the global economy, it is important that we start wiring in Model 2 behavior into our products and services. This blog post sheds a little bit of light on a recent history of flipped perspective authors and practitioners. Future blog posts will look at each of the above contributors and their frameworks of flipped perspectives along with stories of the flipped perspectives in action. What would your product or organization look like if you flipped your perspective? For a humorous look at the wonderful world of innovation and new ventures, check out Fl!p and the gang at Fl!p Comics. This entry was posted in Content with Context, Design, Idealized Design, Learning. Bookmark the permalink.